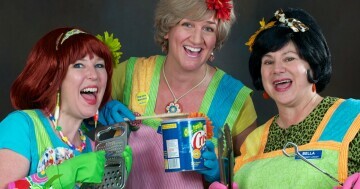 These warm and witty women have created a brand new show of family-friendly comedy skits and songs to help audiences enjoy the spirit of the season, and maybe even create a new holiday tradition to boot. The idea for the “Looney Lutherans” was cooked up in 2006 when the founding members were appearing in the cast of the hit musical CHURCH BASEMENT LADIES at the Plymouth Playhouse in Plymouth, MN. The company has since expanded to include four additional “Loonies”, but all of these talented women have been performing for years as professional actresses, writers, singers, and improvisers. Saturday Dinner by Sweet Clarisse Catering will feature your favorite Lutheran potlucks all rolled into one! A delightful selection of entrées, Wisconsin-inspired sides and desserts. Don’t forget to leave room for the jello mold.